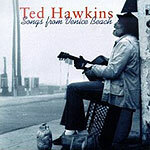 CD review: "Songs From Venice Beach"
A reissue of two of the late Ted Hawkins' European albums, "Songs From Venice Beach" features Hawkins in his strongest musical environment: just his voice and his guitar. This set features mostly covers of R&B classics  songs like "Just My Imagination," Sam Cook's "Good Times" and Jerry Butler's "He Will Break Your Heart." With is simple acuostic guitar strumming behind his crystal clear singing, Hawkins breathed new life into these old favorites. His stark arrangements and impassioned singing make these veteran songs seem brand-new, as Hawkins brings out new colors and hues. Hawkins recorded only a half-dozen albums in his lifetime, but at least now, with the release of "Songs From Venice Beach," all but one are now available on CD  and this may be the best of the lot.